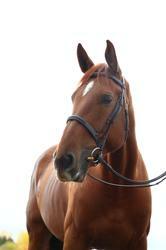 “EZ Tiguan” aka Olé is a 2011 17hh mare by Oxford, out of a Radjah Z mare. 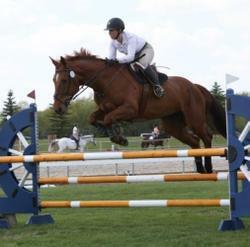 Olé has shown all across Canada and has competed up to 1.25 with a lot of room to spare. She is a perfect 3 ring horse, she will jump anything from anywhere, has jumped up banks, table tops, and practically every natural element I could throw at her. This mare is as simple as they come, and her honesty and will to please sets up every rider that sits on her for success. She is an extremely easy going mare and does not bat an eye at anything, and can be trusted with young kids, adult amateurs, etc. Olé could cart a 7 year old around a cross rail class one day, and take an amateur around the 1.30’s the next. She is perfectly sound, has not required any maintenance, bathes, clips like a dream, ties, trailers. She is a stand up citizen in the barn, can live inside or out. 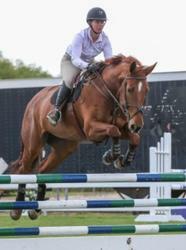 This mare is extremely special and will go to an approved home only! Priced in high 5 figures. Please inquire for more details and videos. 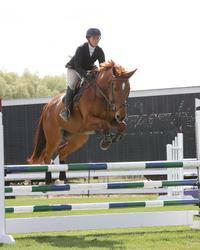 Prospect for 1.45m or 4'9"
Very happy with Big Eq, Thank You.